US Army Special Forces soldier Roy Benavidez, Yaqui Indian (1935-1998). 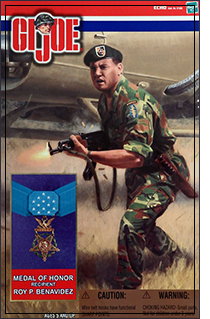 GI JOE action figure, Medal of Honor recipient Roy P. Benavidez (below). Master Sergeant (then Staff Sergeant) Roy P. Benavidez United States Army, who distinguished himself by a series of daring and extremely valorous actions on 2 May 1968 while assigned to Detachment B56, 5th Special Forces Group (Airborne), 1st Special Forces, Republic of Vietnam. On the morning of 2 May 1968, a 12-man Special Forces Reconnaissance Team was inserted by helicopters in a dense jungle area west of Loc Ninh, Vietnam to gather intelligence information about confirmed large-scale enemy activity. This area was controlled and routinely patrolled by the North Vietnamese Army. After a short period of time on the ground, the team met heavy enemy resistance, and requested emergency extraction. Three helicopters attempted extraction, but were unable to land due to intense enemy small arms and anti-aircraft fire. Sergeant Benavidez was at the Forward Operating Base in Loc Ninh monitoring the operation by radio when these helicopters returned to off-load wounded crewmembers and to assess aircraft damage. Sergeant Benavidez voluntarily boarded a returning aircraft to assist in another extraction attempt. Realizing that all the team members were either dead or wounded and unable to move to the pickup zone, he directed the aircraft to a nearby clearing where he jumped from the hovering helicopter, and ran approximately 75 meters under withering small arms fire to the crippled team. Prior to reaching the team's position he was wounded in his right leg, face, and head. Despite these painful injuries, he took charge, repositioning the team members and directing their fire to facilitate the landing of an extraction aircraft, and the loading of wounded and dead team members. He then threw smoke canisters to direct the aircraft to the team's position. Despite his severe wounds and under intense enemy fire, he carried and dragged half of the wounded team members to the awaiting aircraft. 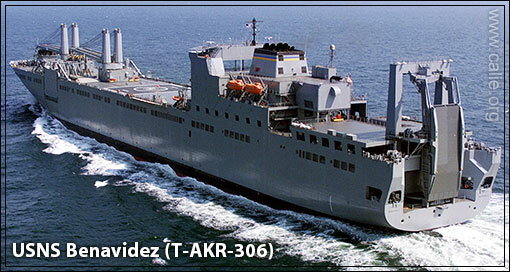 He then provided protective fire by running alongside the aircraft as it moved to pick up the remaining team members. As the enemy's fire intensified, he hurried to recover the body and classified documents on the dead team leader. When he reached the leader's body, Sergeant Benavidez was severely wounded by small arms fire in the abdomen and grenade fragments in his back. At nearly the same moment, the aircraft pilot was mortally wounded, and his helicopter crashed. Although in extremely critical condition due to his multiple wounds, Sergeant Benavidez secured the classified documents and made his way back to the wreckage, where he aided the wounded out of the overturned aircraft, and gathered the stunned survivors into a defensive perimeter. Under increasing enemy automatic weapons and grenade fire, he moved around the perimeter distributing water and ammunition to his weary men, reinstilling in them a will to live and fight. Facing a buildup of enemy opposition with a beleaguered team, Sergeant Benavidez mustered his strength, began calling in tactical air strikes and directed the fire from supporting gunships to suppress the enemy's fire and so permit another extraction attempt. He was wounded again in his thigh by small arms fire while administering first aid to a wounded team member just before another extraction helicopter was able to land. His indomitable spirit kept him going as he began to ferry his comrades to the craft. On his second trip with the wounded, he was clubbed from additional wounds to his head and arms before killing his adversary. He then continued under devastating fire to carry the wounded to the helicopter. Upon reaching the aircraft, he spotted and killed two enemy soldiers who were rushing the craft from an angle that prevented the aircraft door gunner from firing upon them. With little strength remaining, he made one last trip to the perimeter to ensure that all classified material had been collected or destroyed, and to bring in the remaining wounded. Only then, in extremely serious condition from numerous wounds and loss of blood, did he allow himself to be pulled into the extraction aircraft. Sergeant Benavidez's gallant choice to join voluntarily his comrades who were in critical straits, to expose himself constantly to withering enemy fire, and his refusal to be stopped despite numerous severe wounds, saved the lives of at least eight men. His fearless personal leadership, tenacious devotion to duty, and extremely valorous actions in the face of overwhelming odds were in keeping with the highest traditions of the military service, and reflect the utmost credit on him and the United States Army. 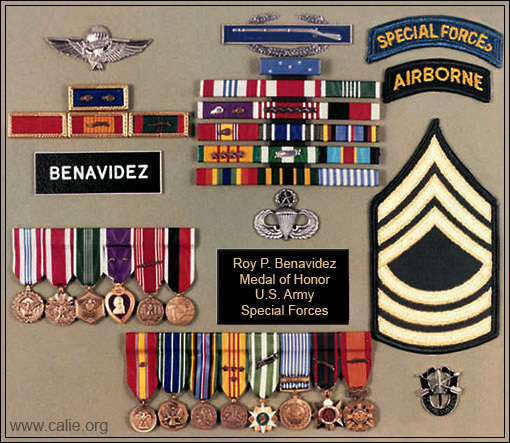 Military ribbons, medals of Master Sergeant Roy Benavidez, Medal of Honor recipient.